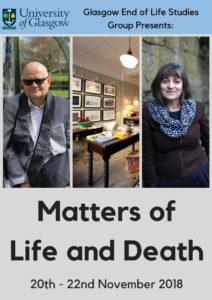 Glasgow End of Life Studies Group is proud to present: ‘Matters of Life and Death’ a series of free events from 20th to 22nd November in Dumfries. 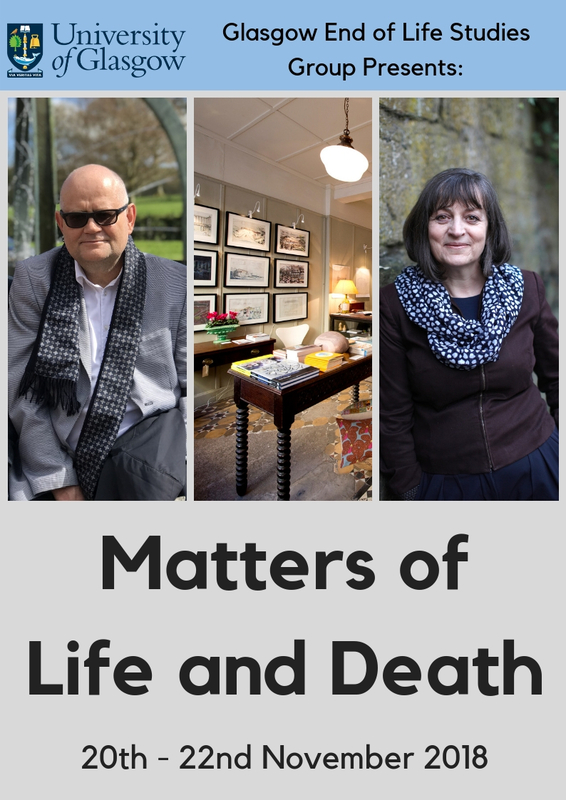 With Sunday Times Best Selling Author Dr Kathryn Mannix and Visiting Professor Lars Johan Materstvedt, as well as guest speakers and academics from the Glasgow End of Life Studies Team, we have a great programme of events in store. According to international convention, PAD includes euthanasia and physician-assisted suicide. Both are voluntary, requested forms of medicalised killings — in the former, a physician injects the patient with lethal drugs, whereas in the latter the patient self-administers such drugs. PAD looks very different depending on which normative ethical theory one takes as one’s point of departure. The lecture will show how various theories can be used to either reject or defend PAD. Furthermore, Professor Materstvedt will demonstrate that very many of the arguments for PAD would also justify the controversial practice called LAWER; i.e. medical murder. Lars Johan Materstvedt is Professor of Philosophy & in Medical Ethics at the Norwegian University of Science and Technology (NTNU) in Trondheim, Norway. He is a Visiting Professor with the University of Glasgow End of Life Studies Group, Dumfries Campus. Everyone welcome to join Professor Lars Johan Materstvedt for his lecture on Ethical Issues in Physician Aid-in-Dying (PAD). 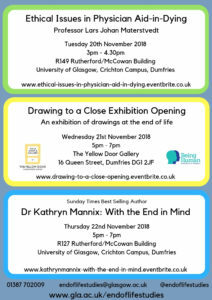 As part of the national Being Human festival of the humanities, and to fit with this year’s theme ‘Origins and Endings’, the University of Glasgow End of Life Studies Group, in collaboration with the Yellow Door Gallery, Dumfries, is organising the first public exhibition of artist Norman Gilbert’s drawings of his wife while at the end of her life. The series of 12 intimate portraits were drawn by Norman as he kept vigil for a week at his wife’s bedside in the hospital. Pat Gilbert, a retired art teacher, died of a stroke in 2016 having lived with Alzheimer’s for a number of years. 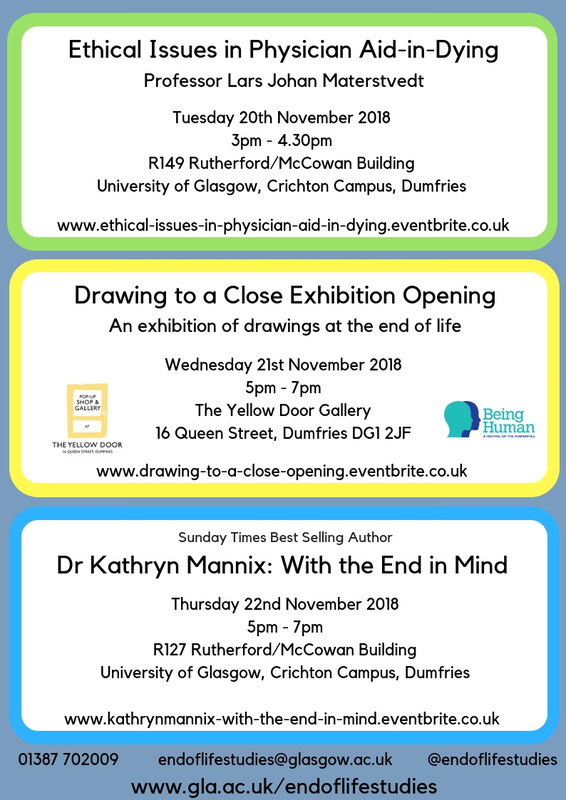 Members of the public are invited to attend an exhibition preview on Wednesday 21st November from 5pm – 7pm when Norman and Pat’s son, Dr Mark Gilbert, Research Associate at the School of Medicine, Dalhousie University, Canada, will be present to discuss the drawings, alongside academics from the Glasgow End of Life Studies Group. We believe that the issues of death and dying need to be discussed more openly in society. Art, in all its forms, can offer a unique way of approaching this universal rite of passage. We hope that the exhibition will help promote honest and open reflections on this sensitive topic. Being Human is a national forum for public engagement with humanities research. The festival highlights the ways in which the humanities can inspire and enrich our everyday lives, help us to understand ourselves, our relationships with others, and the challenges we face in a changing world. Death: saying the word won’t make it happen. Come and talk about dying, death and our forgotten wisdom. Join palliative care experts, researchers and the people of Dumfries and Galloway to peel back a few myths. Let’s shed light on what happens during normal dying, and think about how our community could better understand and support the needs of its dying citizens. We might make you cry; we might make you smile; we will certainly make you think. After 30 years as a palliative care specialist, Kathryn Mannix is on a mission. She feels passionately that it’s time to re-claim public understanding of dying; understand what the process is, and how it allows us to plan and relate to our dearest during the last part of our, or their, lives. It’s time to recognise that, despite the advances of medicine, none of us are immortal and that dying well is a real possibility for which we can plan. In her highly acclaimed book, Dr Mannix explores the biggest taboo in our society and the only certainty we all share: death. A Sunday Times Bestseller, and Shortlisted for the Wellcome Book Prize. Told through a series of beautifully crafted stories taken from nearly four decades of clinical practice, her book answers the most intimate questions about the process of dying with touching honesty and humanity. She makes a compelling case for the therapeutic power of approaching death not with trepidation but with openness, clarity and understanding. Everyone is welcome to join Kathryn Mannix, Professor David Clark, and Dr Sarah Pickstock at this special event.